1. Turkey/Ham. We’re normally eating one of these things well into the New Year. But they should be stored quickly and properly once the festivities are over. Chop up the meat into smaller pieces (several small freezer bags for easier storage) and store the bones separately. Freeze the meat that won’t be used immediately and make stock with the bones. Done! This is safer as it prevents food poisoning and lets you be a bit more creative with your leftover dishes. 2. Donations. It’s a giving time of year so pack up unwanted gifts, older clothes etc. and prepare them to be donated to someone who really needs them. Not only do you make someone else’s day brighter, but also lessen the risk of giving unwanted gifts back to the giver. Recycle used gift boxes and wrapping paper for a special touch. 3. Decorations. 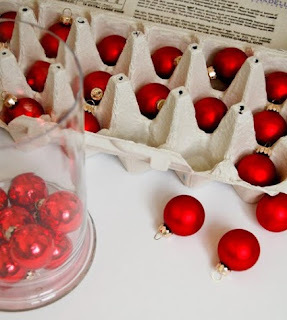 Wrap string lights around hangers, put baubles in empty egg cartons and wrap your synthetic Christmas tree in plastic. It will also help to put all these odds and ends in clear storage boxes so you know exactly what’s inside. 4. Guests. No you can’t store guests, but you can make life a bit easier for them if you get items like suitcase racks (the kind you find in hotels), a simple folding screen (to divide smaller apartments and create privacy) and a portable clothing rack. These simple additions can actually make your guests’ stay more comfortable and your home a little less cluttered. 5. Sales. An odd one? Not quite. If you want to stock up and store Christmas items for next year, the best time to buy them is right after the season is over. Buy greeting card sets and other décor and be prepared. Naturally at The Box we’re happy to do our part. Store all your seasonal items with us, and find useful tools like portable clothing racks, storage boxes and more to help you be organized in your own home as well as in ours. Season’s Greetings and best wishes for 2017 from all of us at The Box!